grevolp6 has no other items for sale. 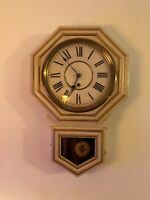 ANTIQUE BAIRD COCA COLA CLOCK CIRCA 1890!! PRICE REDUCED!!! AWESOME!! DESSERT WATCH. CONSOLE BOULLE. PAUL GUDIN LE JEUNE. PARIS. CENTURY XVIII.